A day in the life of our AT team and hopefully some useful hints, tips and resources. This blog post is about Emma and Gemma’s experience of using communication aids to speak, as part of marking the European day of SLT in March 2018. We wanted to try to put ourselves into the position of our AAC users, and experience what it is like to rely on AAC while out and about doing fairly regular, day to day tasks. We had arranged to set up a stall in the hospital outpatients area later that morning, so thought it was a good opportunity to begin our day with a couple of these tasks. We also hoped that by using AAC out and about, we would raise awareness of AAC with members of the public that we met. We decided that we would do one job each, and the other person would observe what was going on from an outsiders perspective. We would only use unaided, non-verbal communication, and one method of powered (or high tech) AAC. Both tasks were very straightforward, and actually required only a very small amount of AAC to get by. Despite this, we found our experiences to be highly valuable and insightful, giving us a snapshot of how it feels to be an AAC user. My task was to go into a shop to buy a stamp. I decided to use an iPad with Predictable; an app which I am relatively familiar with and works on both iOS and android devices. Before we set off, I made sure to add some pre-programmed phrases, so that I could quickly communicate what I needed. I was amazed at how anxious I felt before setting off. We were going to a local shop- what if they recognised me? What if they responded in a negative way? What if other people stared? – all things which surely go through the heads of our AAC users when we ask them to practise in real life situations with devices, apps, access methods and software packages that may be completely new and alien to some clients. When walking to the shop, I also felt empathy with users that had commented to me that they didn’t feel confident to have their device accessible when out and about, in fear of their public safety. I was only carrying my iPad and still this thought crossed my mind. What about our users who need their device mounted to a wheelchair, or those that wouldn’t physically be able to defend themselves if anything happened? When I got to the shop, it looked fairly quiet, which reassured me. I went to the counter and was greeted by a member of staff. I used the iPad to say good morning, and ask for a stamp (both in my saved phrases). The lady nodded and said “first class?” I panicked, and rather than just nodding my head, I went into my phrases to confirm “first class” back to her. The lady quickly got me my stamp and I gave her the money, and said “thanks”. I wanted to make sure that we told them a bit about what we were doing before we left, so I (again using pre-programmed phrases) said that we were from the Barnsley Assistive Technology Team and were using this to demonstrate how people may use technology to support their communication. The lady nodded, and I left the shop. As we left, I reflected on how strange the whole interaction felt, in comparison to if I had been a speaking customer. I know the staff are very friendly, and usually would have asked a question about what we were doing, or offered a comment about the day. Today, the conversation was limited to just what was needed, and it was as though because I wasn’t talking, my communication partner didn’t talk either. I was really surprised about how it had made me feel , and because of this, I had forgotten to ask for some change. I found that I could stick to the routine with my pre-planned phrases, but if anything about the conversation went off track, I found it very difficult and panicked. I could have very easily used the keyboard to type something out, however this would have taken up more time, and I didn’t want to keep other people waiting. It was very difficult to combine using the app with more natural means of communication such as using eye contact and smiling, which again added to my anxiety of trying to include being polite and friendly, while at the same time trying to use a different system. Gemma noticed that as a short queue built up behind me in the shop, other customers were immediately looking at me and the iPad, which as someone who hates being the centre of attention only added to my anxieties! I think if I had the choice of someone else being able to carry out this task for me, for ease and speed, I would happily accept their help. It is no wonder that many of our AAC users report that they sometimes let someone else do the talking for them in such situations, and similarly demonstrates how driven, motivated and inspirational the clients that do use their devices while out and about are. My task was to ask for help finding the milk, and then to purchase this at the shop. I used the Speech Assistant app on Samsung smartphone, which is a free text to speech app available on Android operating systems. I decided to go with using an app on my phone because it could fit in my pocket, and if I was to use AAC, I would prefer something portable and small where possible. I had tried using the app the evening before with my husband in which I was free typing out all of my messages to him. I found that typing out my message on each turn in the conversation was slowing me down, and when I tried to speed up typing, I was making mistakes with pressing letters on the keyboard. I also found that whilst typing, I was unable to give eye-contact to my husband. I decided for my task the next day, that I would set some pre-programmed phrases as I had a good idea about what I was going to ask at the shop. I felt this would support my social engagement with the conversation partner. I was like Emma, feeling anxious before this and had similar thoughts running through my head. I visit the shop regularly so wondered if someone may recognise me. I felt somewhat self-conscious. I was anxious of how the people I communicated with may respond. I first approached an assistant to ask where the milk was using the AAC app. I tried a different approach to Emma of informing the shop assistant before asking my question using a pre-set phrase that I am using an app on my phone to help me communicate. The shop assistant put me at ease as her approach was warm and understanding. I asked her where the milk was using the app and she showed me. I then stood in the queue at the check out. The lady at the checkout was having a conversation with the customer in front of the queue, making jokes. She looked to me as she was joking. Perhaps if I was verbally speaking, I would have joined in and commented, but I realised I did not have a phrase ready on my device to respond, and was also anxious of their reaction if I used my phone instead. When it was my turn to pay for my milk. I informed the lady at the checkout that I was using an app to help me communicate. I then asked how much the milk was and thanked her. Her response was supportive, and she used some unaided strategies to support the conversation. I did feel a contrast to the previous customer, as the lady did not engage in as much ‘small talk’ with me. Perhaps she was feeling unsure too how to respond? I too like Emma, felt my communication was focussed on what I needed. The experience enabled me to empathise so much with the clients I support in my role. Previously, I may have underestimated how it could feel to use AAC to support social communication. I considered how I may have set targets previously and offered recommendations for using AAC, without having the experience myself. I considered Janice Light’s model of communicative competence, in which perhaps the area I was working on was ‘social’ competence, adapting to use AAC as a method of communication socially. I considered that for many of the people who use AAC, there are many other goals and targets they may be working on first, such as learning to access a system, learning to use symbols, learning the location of vocabulary, learning to build sentences. Many people with AAC too may have physical or sensory difficulties where learning to use a device in a social situation is just one part of their AAC journey. I was glad to have Emma with me as someone else I could share the experience with. This further consolidated my feeling that clients using AAC may benefit from meeting other AAC users, such as in AAC user groups, aphasia cafes, and charities such as ‘the stroke association’ and ‘One Voice’. Following this experience, I have shared my experience with some of the clients and carers I have since visited, and I have found this to be a positive way of demonstrating that I can personally identify with some of the experiences they may have using AAC. I feel so pleased that I tried this, as now I understand more than ever, what it can be like for someone using AAC to support their communication. As mentioned above, we were both using very simple apps, a direct access method and a text to speech system. Throw into the mix the often complex access methods, symbol systems, and navigation around software packages that some of our users have, it is not surprising that clients (sometimes with additional cognitive difficulties) often find it highly challenging to use their devices in public places or to carry out everyday tasks with unfamiliar communication partners who know very little about AAC. It will definitely make us think twice when setting goals with clients, and certainly help us to empathise with clients who find this aspect of AAC use more challenging. We would recommend anyone who works with AAC to have a go at something like this, in order to experience first hand exactly how it feels. We also raised £20 on our stall which we have donated to communication matters. Thank you to everyone that came to talk to us! This entry was posted in AAC, Team News, training on 20/06/2018 by gemmasleman. On Wednesday 6th April, the Barnsley AT Team delivered two new eye gaze courses. The morning session was all about developing early eye pointing skills for communication and looked at how we can identify children who might use their eyes for communication and the resources we might use to develop these skills. As part of this session we compared three different low tech AAC strategies: Etran frames, symbol boards and Eye Link boards. We even ran our own mini-experiment to see which communication method was the fastest! Not many Speech and Language Therapists are aware of Eye Link, but our experiment suggested that for many people this was an easier and quicker method of communicating using eye pointing. For more information on Eye Link and details of the study we took inspiration from, see a write up of a study on Eye Link. The afternoon session focused on eye tracking technology. We looked at how eye tracking technology works and compared a range of eye trackers and software. Participants were able to try out a range of communication aids and eye trackers for themselves. We explored how to achieve a successful calibration and discussed a wide range of troubleshooting strategies. This entry was posted in training on 20/04/2016 by Helen Robinson. Our names are Chloe Tivendale and Ellie Rodd, we have been studying OT for a little over a month now, In terms of what OT is, generally I would explain it as enabling individuals, no matter what their circumstances to participate in the activities of every day life. In terms of this placement, that would mean providing Environmental Controls, Augmentative & Alternative Communication and Computer access devices, to enable clients to live as independently as possible. During our time here, we attended training on Environmental controls and Computer access- in depth. This was delivered to various professionals from around the local region in order to increase awareness of Environmental controls and Computer access as well as informing people about the role of the team as they expand.This was great as it gave us an understanding of assistive technology before we went out and visited clients within their own homes. We also got the opportunity to try out various pieces of equipment, such as computers which could be controlled by almost any part of your body, including Eyegaze. We also learnt about the various models and principles used within AT such as ‘Matching Person and Technology Model’ and the ‘Universal Principles of Assistive Technology’ and how this differs to “traditional” OT models. When using such models, an OT must look at the person, their environment and their technology and how these affect each other, in order to decide which device would be best suited to the client. What surprised us personally was how much the OT must consider the prognosis of the client, as the client may be able to use a piece of equipment now but not in the near future, due to the effects of their condition. One example of this may be a client with Motor-Neurone disease who uses a voice controlled switch to access their device, however if the individual was to lose their voice, the device would no longer be of use. This means the client would need to learn how to use a completely new method, which as you can imagine may be difficult. As students with no prior knowledge or experience of AT, we were surprised at just how sophisticated the equipment used was, which was great to see. For example, we watched a video previously filmed by the Barnsley AT team, of a client with MS using a Sip and Puff switch method to access her device, as well as headmouse being used as a cursor, which was particularly interesting. This placement gave us the opportunity to meet clients with a variety of conditions such as Motor Neurone Disease and Wernickes Asphasia, seeing the equipment applied within a real life situation, within the home, made us realise just how important and life changing AT can be. We found that the way in which the AT team approach their work was very client centred and everyone was very willing to adapt the AT to suit the individual’s lifestyle and needs. We would like to thank Jenny, Stewart and the rest of the AT team at Barnsley Hospital for the opportunity to join them on placement as well as being so welcoming, we had a brilliant time and it really opened our eyes to OT in a non-traditional setting. We would like to wish the AT team the best as they expand to cover the rest of Yorkshire and Humber. This entry was posted in student-education, training on 06/11/2015 by Jenny Scott. On 21st October twenty-two professionals from across the Yorkshire and Humber region came together for the inaugural meeting of the AAC Clinical Excellence Network in Leeds. The group is affiliated to the Royal College of Speech and Language Therapists, but membership is open to any professional working within the field of AAC across the Yorkshire and Humber region. On the agenda was the official swearing-in of the committee members, followed by the AGM. We then shared our experiences of this year’s Communication Matters Conference which was also held in Leeds, on the 13th-15th September. Helen Robinson talked to the group about the extensive range of training opportunities offered by the Barnsley AT Team. 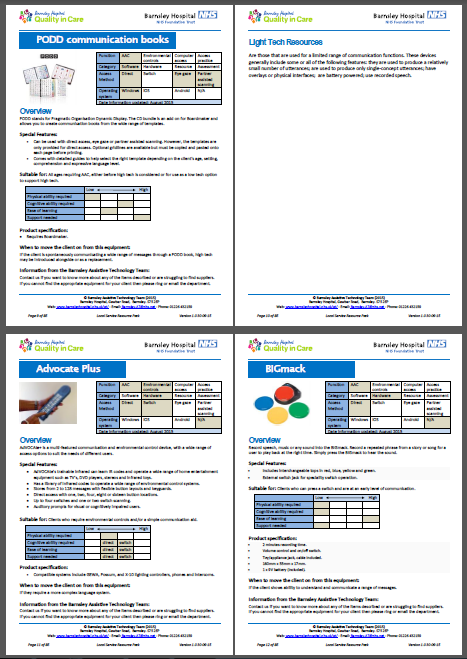 The current courses we offer and dates available are on our website www.barnsleyhospital.nhs.uk/assistive-technology/services/training-courses/ – but please also get in touch with ideas or requests for training. Finally, each professional gave the group an update on how AAC is currently provided in their local team. As part of the Barnsley AT Team’s role as the Specialised Service for AAC and EC we are rapidly expanding the areas we cover and it is really valuable for us to understand AAC provision across the region. Over the coming months members of our team will be meeting with local services to discuss how our service will support their clients with AAC. There was certainly a real buzz about the CEN and attendees were pleased to have the opportunity to come together and discuss AAC. We did have quite a long list of people who wanted to attend but couldn’t due to the room capacity. Our next meeting is at Henshaw’s College, Harrogate on 20th January 2016 and we will have a much bigger room so hopefully all those that wish to attend will be able to! Tickets will be available via our eventbrite site shortly. This entry was posted in AAC, events, service delivery, training on 23/10/2015 by Helen Robinson. Yesterday we delivered our first Motor Neurone disease Study day here at the Barnsley Assistive Technology Team. This was developed in response to increasing demand from professionals in or area for training around assistive technology for this client group. Helen Robinson and Marcus Friday presented to a wide range of professionals from across the region, including; Speech and Language Therapists, Occupational Therapists and Regional Care Development Advisors from the MND Association. We covered Alternative and Augmentative Communication methods and Environmental Controls, with a mix of teaching, discussion and hands on exploration of the equipment. We also shared some of the initial data from a recent focus group with people living with MND and their carers at SiTRAN in Sheffield, which was lead by Simon Judge from our team. We were joined by our guest speaker, Jennifer Benson, Speech and Language Therapist, who kindly came along to tell us about her experience of using the Model Talker speech synthesis software. Jennifer is soon jetting off to Orlando, Florida, to talk about this process and we are sure they will be as impressed with her presentation as we were! The day generated lots of discussion around assistive technology for people with MND and we received some fantastic verbal feedback from attendees at the end of the day. This entry was posted in service delivery, training on 21/10/2015 by Helen Robinson. The pack is a handy go to guide for professionals working within the field of Assistive Technology, containing one page profiles for AAC and Environmental Control products and resources. This includes; communications aids, switches, computer access peripherals, remote controls, mounting solutions, assessments, toolkits and software. The products and resources within the pack are those which would usually fall within the remit of local services to provide under the new NHS England Specialised Services commissioning guidelines. We plan to update the pack on a regular basis and adding more products over thee coming months. We hope you find it useful! This entry was posted in AAC, computer-access, Environmental Control, mounting, Resources, service delivery, training on 08/10/2015 by Helen Robinson. Barnsley AT team are helping to train a new batch of trainee clinical scientists! I’m Simon, and I’m one of them. Along with Elliot, another clinical science trainee, I recently spent a week seeing the good work of the Barnsley assistive technology team all across Yorkshire. We had a great introduction to the variety of things that the team do – providing the right technology to help with any complex access, communication and environmental control needs is no mean feat! We found ourselves fitting a custom-made clip-on arm to hold a tablet to a little girl’s standing frame so that she could communicate with people; we wound up remotely setting up a special user interface to help a client who struggled to use a computer; we got to see a triage meeting where new referrals are discussed; and somehow we ended up testing several new devices under development – amongst other things. One particularly interesting part was a challenge given to us by Michael (who is rather good at making mechanical modifications to equipment in his evil villain’s lair workshop deep below Barnsley Hospital). A holder had to be made to keep a communication aid on a wheelchair arm, while allowing it to be put on and off easily by someone lacking fine motor control. The amount of thought that goes into every aspect of the work is fantastic. Clinical scientists are the cross-disciplinary people in NHS healthcare science, responsible for giving the best clinical services that science can provide. There are lots of clinical science themes, from genetics and neurosensory sciences to medical physics and clinical engineering: assistive technology comes under engineering, and nearly half of the team at Barnsley were trained as clinical scientists in engineering, so anyone who is thinking about a career helping people in the way that Barnsley AT team do could do worse than looking at becoming a clinical scientist! If you are interested, anybody with a related degree can apply to become a trainee clinical scientist on the Scientist Training Programme. This entry was posted in training and tagged trainees service-delivery on 13/04/2015 by simonmarchant.